INDIANAPOLIS — The Heroes Foundation has chosen two Indiana University Melvin and Bren Simon Cancer Center researchers to receive $51,000 in grant funding over a three-year period to propel their research forward. Through these awards, the Indianapolis cancer nonprofit organization is continuing its financial support of both Dr. Grzegorz Nalepa and Dr. Safi Shahda. “The Heroes Foundation was able to make a critical impact on the development of Dr. Nalepa and Dr. Shahda’s initial research. Watching their projects and knowledge develop has been exciting. Our hope is that continued financial support brings about breakthroughs, and we don’t think that’s an unreasonable wish,” Vince Todd, Jr., Heroes Foundation chairman and co-founder, says. 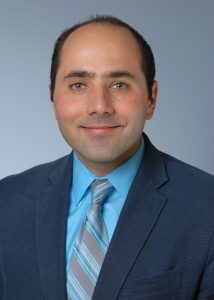 Dr. Safi Shahda, Assistant Professor of Clinical Medicine at the IU School of Medicine, is focused on what he calls the Achilles heel of the cancer cell: mutations. During his team’s analysis of different types of cancer samples from patients, they have learned that some patients may have tumors with defects that can make the cancer susceptible to certain chemotherapy drugs. “Since these drugs are ‘off patent,’ one challenge is that drug companies may not have incentives to further combine these drugs in new studies, or explore how well they work against cancers with mutations that we propose to target,” Dr. Shahda says. The Heroes Foundation’s SJP Heroes Cancer Research Fund supports a researcher for three years. Dr. Shahda will receive a total of approximately $25,000-$30,000 from 2016 to 2018, already having received $10,000. With these funds, his team will be able to purchase commercially available drugs not covered by patients’ insurance and treat patients who are in desperate need of effective treatments. The funds will also allow him to explore Precision Oncology — to recycle and combine older chemotherapy drugs to target specific cancer vulnerabilities. The Heroes Foundation has supported Dr. Shahda’s work since 2015. 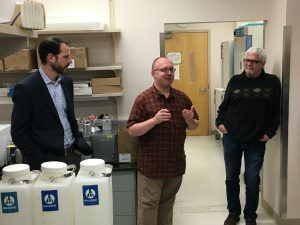 Heroes Foundation board members Dr. Jeff Wells (left) and Steve Peachey listen as Dr. Grzegorz Nalepa discusses his researcher during a 2017 lab tour. The Heroes Foundation’s Team JOEY program, focused on pediatric cancer research, awarded Dr. Grzegorz Nalepa a total of $30,000 (to be disbursed over three years). Nalepa is an Assistant Professor of Pediatrics at the IU School of Medicine and a pediatric oncologist specializing in acute leukemia and rare childhood tumors. “In my lab, we wish to cure more children while minimizing side effects of anti-cancer therapies through understanding weak spots of live cells isolated from our little patients and developing better animal models of their cancers,” he says. The Heroes Foundation’s initial support, begun in 2015, allowed Nalepa to get his team’s high-risk, high-reward project off the ground and make significant progress, evidenced by additional awards from the National Institutes of Health in the form of a prestigious RO1 grant and invited presentations/achievement awards from the American Society of Hematology. The Heroes Foundation’s Medical Advisory Committee recommended both grant recipients, and the board of directors approved the recommendations.